Prologue: Masked, armed and ready for action, Casey Jones prowls the rooftops. He sees a gang lifting goods from a truck and drops in on them. He fights his way through the punks with ease until a midget in a cape steps out and orders “Big Joe” to deal with the interloper. A humongous sumo wrestled then lifts Casey over his head and piledrives him into unconsciousness. The midget orders Big Joe to take Casey back to their hideout where he’ll be properly dealt with. Not far away, the Turtles hear the sound of violence and rush to the scene. They’ve missed the gang, but find Casey’s hockey stick and a trail of blood. Concerned, they follow the trail to an old apartment building. They scale the fire escape to the one room that’s lit and peek in. Inside, the midget is about to execute Casey (who is tied to a chair) by injecting him with a “sushi overdose”. The Turtles smash through the wall and confront the midget. 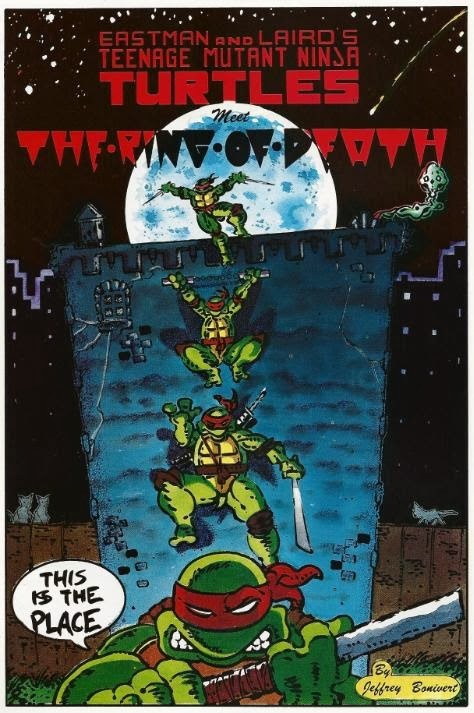 The midget declares himself the leader of a criminal organization called the Ring of Death and sends his punks to attack the Turtles. They make short work of the punks, but then Big Joe shows up. Donatello takes Joe on singlehandedly and lectures the sumo wrestler all the while. Don informs Joe that size is nothing unless you have skill, endurance and courage. With that said, he topples Big Joe. The leader of the Ring says that he’s fatally embarrassed and allows the Turtles and Casey to leave without any struggle. As the sun rises, the Turtles disappear back to the rooftops, leaving Casey to call the police. *J.B. Bonivert also produced the TMNT stories “The Purpose of Fear” and “Muscle & Faith”. 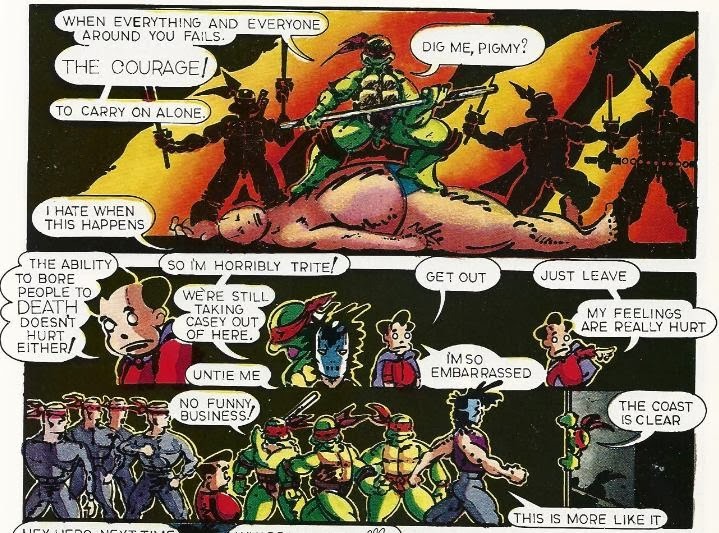 Well, this is the last of J.B. Bonivert’s TMNT comics for me to review and since I’ve already expressed my opinion of his art style, I won’t bore you by repeating myself. Instead, I’ll talk about the story. "The Ring of Death" is simple to the point of being stupid, lacking the introspective character focus of “The Purpose of Fear” or the decompressed adventure of “Muscle & Faith”. Casey gets kidnapped by a gang, the Turtles save him, The End. There’s one moment in the story where Donatello delivers a clumsy speech about discipline and courage, but it’s like I said: clumsy. I suppose Bonivert felt the need to add a “lesson” to the end of the tale, but it only awkwardly ties into anything going on in the narrative (“brains over brawn” is a pretty tenuous association to make). It’s a highly forgettable story that suffers from Bonivert’s usual shortcomings (particularly the dialogue, which is just a stream of awkward asides and prattle). I’d say it’s the least enjoyable of Bonivert’s TMNT contributions, and I’m not his biggest fan to begin with.